Dynacraft is a diversified global manufacturer of PACCAR medium- and heavy-duty truck parts sold under the Kenworth, Peterbilt, and DAF nameplates. For more than 40 years, Dynacraft has provided the company’s truck manufacturing divisions and PACCAR parts division with high-quality components, subassemblies, and specialized services. Although Dynacraft runs more than 200 assemblies daily through its production line, one manual measuring arm and a few technicians were sufficient to keep up with sample testing. It took very little introspection, however, for the Dynacraft quality team to determine there was absolutely no way they could do a 100-percent inspection with their existing process. An automated solution would be required to meet the customers’ expectations. and needs. We have some projects that are similar to others, but inevitably every customer has a slightly different process with slightly different requirements. Depending on what the problem is, we tailor the solution to that.” The ideal solution for Dynacraft would have to conform to a size profile allowing it to fit within an in-line work cell on the shop floor, be fully automated, and have the ability to measure a 6-foot long canister with 50 to 60 variations—all within 65 seconds. 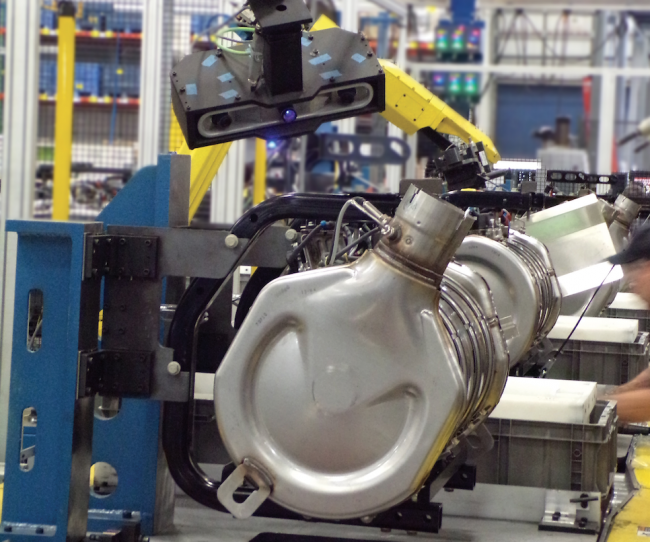 combinations of measurement, automation, control, and integration elements that need to come together for an optimal solution.” One of the system components that VRSI employed was a FANUC robot arm. For the metrology end of things, they chose the FARO Cobalt Array Imager. “Part of the reason we like to work with FARO, in general, is just because they’re a very reliable supplier,” says Asher. and some are kind of in the middle, more like black dull metal. Also, the angle at which the Cobalt has to measure the surface [due to space restrictions] contributes to a difference. So, what we did was, for each of those positions we dialled into a different exposure setting. Sometimes one exposure setting was sufficient, sometimes we needed multiple exposure settings. To capture certain features effectively, we actually shoot three different exposures to achieve a proper measurement.” The high dynamic range of the Cobalt, and its ability to measure shiny surfaces, make it a natural choice for in-line factory metrology solutions. 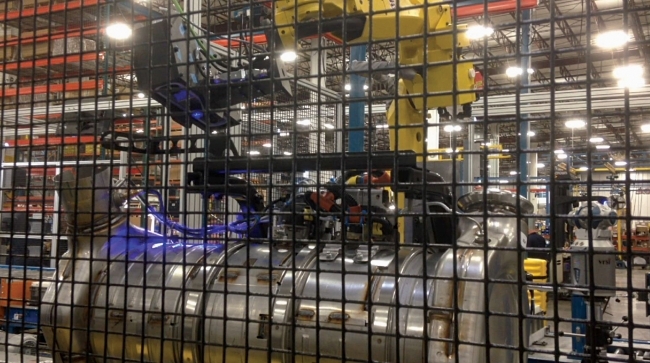 The Dynacraft facility runs 26 production lines. Twenty four of them are almost entirely manual, one other being semiautomatic—one operator and one robot. And then there’s the new QC line. Although at the time of this writing, 100-percent inspection is the exception rather than the rule in manufacturing, it is being called for more and more. It is already the norm in much of aerospace and medical device industries. As OEMs seek to mitigate risk factors, and suppliers seek to differentiate their organizations from the competition, no doubt it will come to the forefront as the premium QC process.